Wed., Sept. 7, 2016, 2:59 p.m. 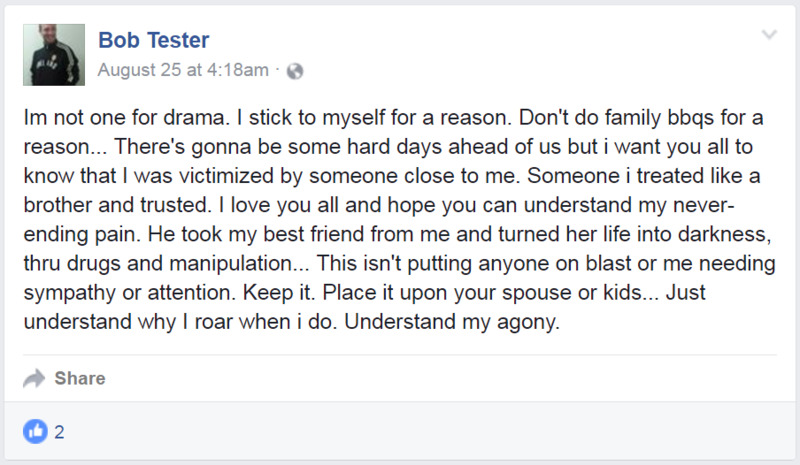 The most recent post on homicide victim Bob Tester's Facebook page, dated Aug. 25. Homicide investigators suspect a nephew of U.S. Sen. Jon Tester, of Montana, may have been killed with a wood-splitting maul in his home near Spangle as the victim’s young daughter was told to stay in a bedroom. Robert Tester’s 8-year-old daughter told Spokane County sheriff’s deputies she was in bed with her father when a man entered the home and awakened them, wielding what she described as “a sword and a knife,” according to court documents. “The man told her to stay in bed because he was going to kill her dad,” court documents state. The girl likely didn’t witness the killing, Deputy Mark Gregory said. But court documents say she called her grandmother to report his death. Deputies found Tester’s body in “a large pool of blood” on the living room floor. The ax-like maul lay nearby, stained with blood. And deputies found “blood on the walls and floor throughout the residence,” court documents say. Deputies also found bags of marijuana near the body, and the home reportedly smelled of pot. The girl’s grandmother told deputies her son grew and sold marijuana to medical dispensaries, although new state laws effectively ended such sales outlets. Tester and his daughter had lived at the home for several years, said the property owner, Myron Iseminger, who lives in Maryland. Several neighbors said Tuesday they had not met Tester. Court documents don’t mention a person of interest in the killing. But a detective included the full text of Tester’s last Facebook post dated Aug. 25. Tester’s Facebook page says he graduated from Charles M. Russell High School in Great Falls in 2000. He was divorced from an Idaho woman and appears to have lived in several towns in Kootenai County. Gregory, the sheriff’s deputy, said Tester’s daughter is staying with family. Attempts to reach other relatives Wednesday were unsuccessful. Published: Sept. 7, 2016, 2:59 p.m.